The Historical Childrens' Literature database chronicles by example the history of educational practice and reading, and the changing perceptions of gender, race and class and the role of religion in teaching. Both European and American books from the 18th to the 20th c. are represented in this collection. Early recreational reading by any age group was uncommon and books created specifically for children before 1700 are quite rare. It is assumed that books of the 16th and 17th centuries showing fanciful creatures such as the cameleopard [giraffe] and the manicore were the focus of children’s interest. 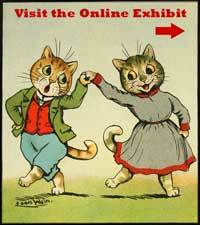 In the 18th Century, children's books are more common, many designed to instruct with little entertainment value. Stories proved that good children were always rewarded, sometimes just by a virtuous death; bad children inevitably suffered and were punished. For pleasure there were chapbooks, small 16 page pamphlets amied both towards children and adults that recounted stories of knight fairy tales and sensational happenings of the day. Dramatic changes happened in the book world in the 19th Century and many new techniques were tested on the child market. Illustration and color printing remake the book and the text based black and white children's book of 1801 to multi-color, multi-image books in 1899. Such illustrated covers made books more interesting to children and more saleable to parents. This digital collection was created with the CONTENTdm software's innovative new program, JPEG 2000, which enables finely detailed materials to be displayed in a higher quality, more usable online format. It allows viewers to see image details that would be difficult or impossible to see at the lower resolutions used in the normal software. This new software includes pan and zoom capabilities which allow moving in and out of the image and moving across the image to display the details. The books and ephemera presented in this digital collection were scanned from original materials as TIFF files, manipulated in Adobe PhotoShop to achieve the best and clearest possible digital image and loaded into the Contentdm JPEG 2000 software and linked with descriptive metadata. 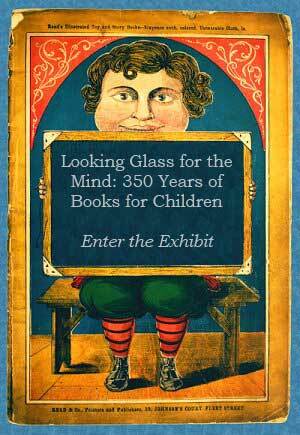 The Special Collections exhibit "Looking Glass for the Mind: 350 years of books for children", March-May 2008 was a collaboration between donor Pamela Harer and Rare Materials curator Sandra Kroupa. The digital collection was supervised by Kristin Kinsey and the research and descriptive metadata was prepared by Kylie Fullmer and Melissa Mather in 2008-9. The materials in this database are selections from the 2008 exhibit but also contain other materials, primarily from the Historical Children's Collection held by the UW Libraries Special Collections Division. This exhibition features historical children's books from both the Libraries' Special Collection Division and those on loan from collector and donor, Pamela Harer. Pamela Harer and Sandra Kroupa, UW Libraries Book Arts and Rare Book Curator, co-curated the physical exhibit that was on view from March - November 2008.